This move comes as a result of the recent upgrade to our charting package, which we are pleased to say was very well-received by our customers. Effective from the 14 April 2014, the “Legacy Charts” will be brought down, to make room for our new and improved “Live Charts” and the “Java application” which you can download right here. Get access to tick-by-tick data for Forex & Random Indices or daily, hourly, weekly and monthly prices for Stocks, Indices, Commodities & Sectors. Now you can export data directly from the Live Charts to CSV, JPEG, or PDF. Look for the icon button on the top right corner of the chart (circled in red) . Try our “Live Charts” now! 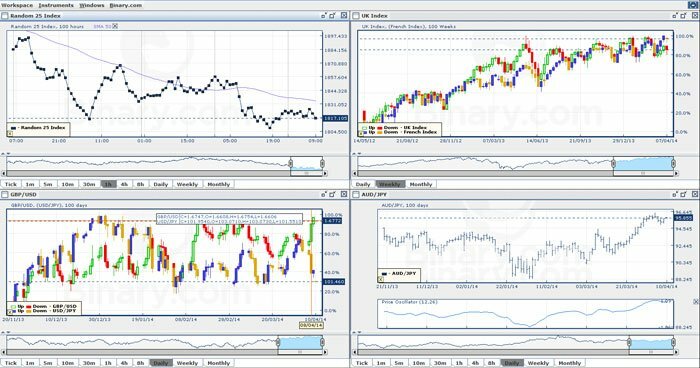 Download and install the java charting application for PC or Mac to customize your own charts based on your individual trading strategy. The application allows for a wide range of indicators and overlay features for a customized view of the market. You can save your work space and pick up where you left off in an instant.